July 09, 2010. I was blog hopping and stumbled on an interesting site -- Hello to Earth - traveling the globe one step at a time. The author, Lilia, was having a contest. 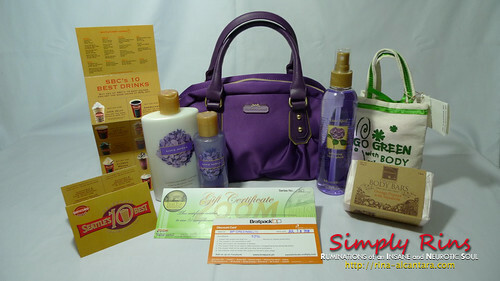 I simply have to answer 2 questions and submit the answer by posting a comment in her contest entry. I tried my luck and joined. Two weeks after, I received an email from Lilia, notifying me that I won her contest! I've never won anything online before and this was really a surprise. And yes, I got excited. :) After a few email exchanges, I finally met Lilia last Thursday to get my prizes. Posing with Lilia right after she handed me a fabulous purple handbag. Coincidentally, I was wearing a striped purple blouse that I borrowed from my sister! I should also mention that I colored my nails purple that day too which I'll feature in a separate post. So do come back very soon! Let's take a look with what I got. 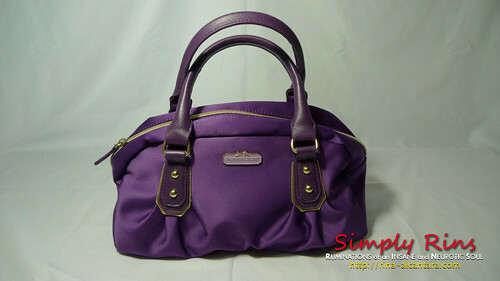 The shiny purple bag. This wasn't posted in the contest entry, so it really put a smile on my face that Lilia included it to carry all the prizes. A peek at what's inside. It was definitely a purple day! The prizes, up close and personal. 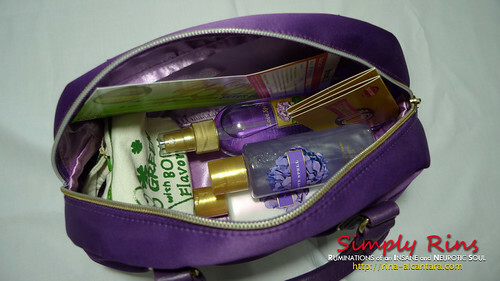 and the Victoria's Secret Purple Bag!